While elegant Rio de Janeiro and cosmopolitan São Paulo are best-known places in Brazil, the North is the most unexplored part of the country. Its cities developed during the rubber tapping cycle of the XIX century. Nowadays, the region tries to protect the most valued thing there: the Amazon forest. Belém - Capital of Pará. Boa Vista - Capital of Roraima. 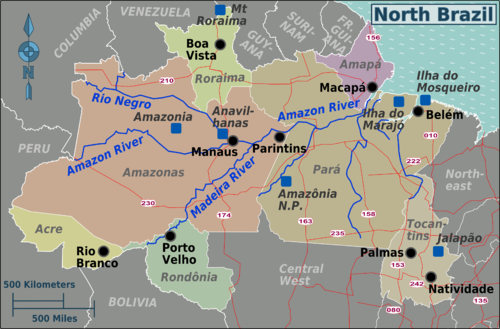 Macapá - Capital of Amapá. Manaus - Capital of Amazonas. Natividade - A historic town from the mining ages in Tocantins. Palmas - Capital of Tocantins. Parintins - Famous for the Boi Bumbá festival, a celebration of Amazonian culture. Porto Velho - Capital of Rondônia. Rio Branco - Capital of Acre. This page was last edited on 26 August 2016, at 13:45.